On the first morning of the trip to the Tracy Arm – Ford’s Terror Wilderness, I woke up in a comfortable bed in a cabin on board the Safari Endeavor (Un-Cruise Adventures was our gracious host and our transportation for travel between Juneau and Endicott Arm). But I woke up at 3:30 am to see whether the sun could find a break in the low clouds and mist as it rose at a little before 4:00 am. Those clouds were thick, though, and a persistent drizzle followed us up the length of the beautiful fjord, allowing just enough of a view across the water to pick out Sumdum Glacier and a few other landmarks in the early morning hours. As we neared the head of Endicott Arm, we slipped from the ship directly into our kayaks and paddled a short distance to our campsite within sight of the spectacular Dawes Glacier. It was at camp that we were encouraged to consider how it felt to transition from the luxury of the Safari Endeavor to an isolated beach in the midst of monstrous mountains with exposed bedrock, thundering waterfalls, and the icy face of the Dawes. 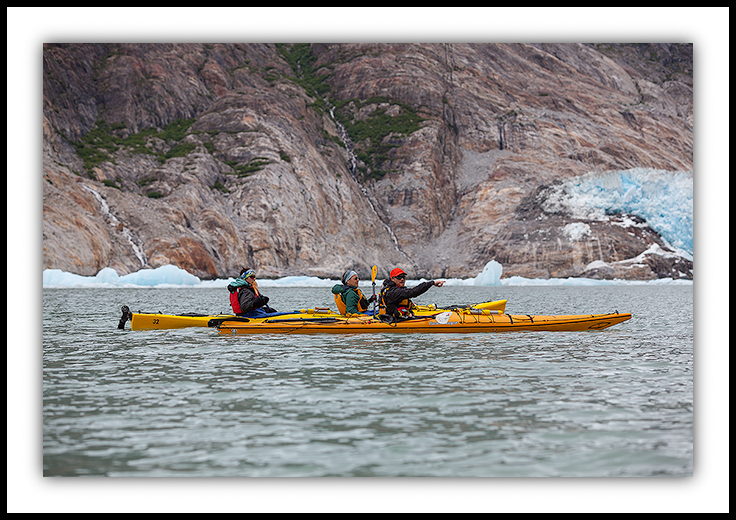 The rain came and went, and yes, it was cold, but we couldn’t fight the urge to return to our kayaks and chase a closer look at the catastrophic and spectacular phenomenon of a calving tidewater glacier. 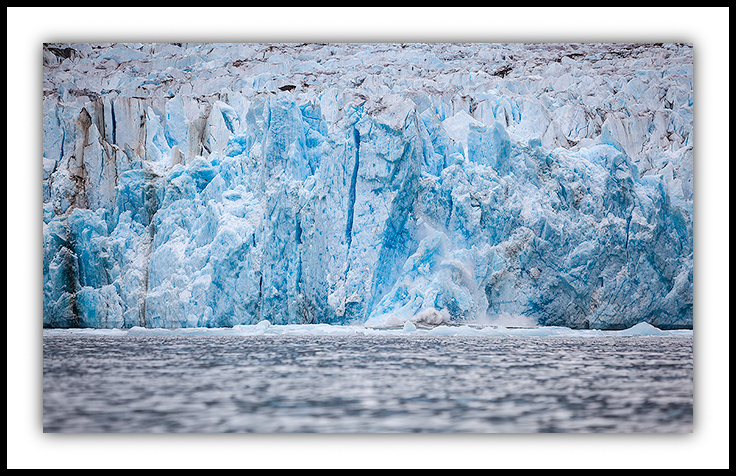 The Dawes Glacier was virtually relentless in its activity during the time we spent at our first camp, and nearly the entire length of the face showed newly exposed ice between the time we arrived and the time we left. So enamored were we with the sight of a large tower of ice pealing off from it’s adjacent structure and crashing to the water that is was nearly impossible to stifle the reflex to look up every time roar of a calving event, this even though we were well aware that we were hearing the sound seconds after the even had taken place. Minutes later, the largest of the new icebergs would send us another sign of their birth when ocean swells turned to waves rolling onto our little beach, raising the level of the water by several feet. 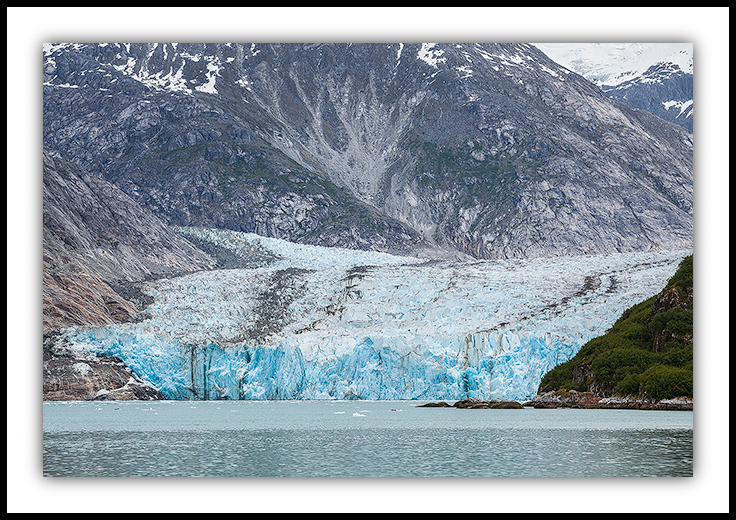 Even during the times I laid awake in my tent those nights near the Dawes, because I have a tendency to sleep less while camping, the calving glacier was present in my thoughts, sending thunder rolling down the fjord and echoing off its sculpted granite walls. Splendid work! I can’t wait to see more! Jackson – It’s always great to hear from you because it reminds me to check in on your blog and see how things have been going for you lately. I hope all is well!